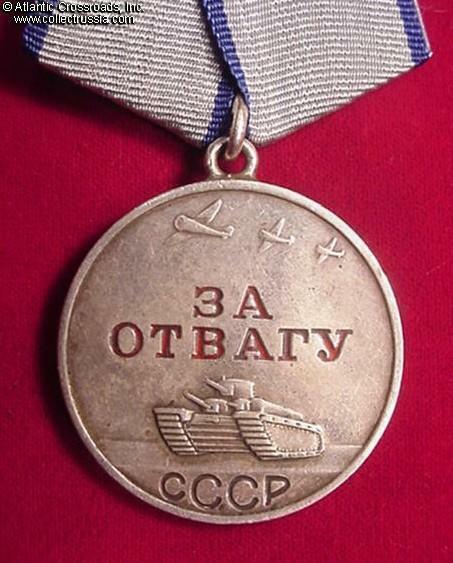 $1,600.00 Ushakov Medal, #13744, awarded in April 1955 to a Petty Officer of the Black Sea Fleet. In excellent condition, and includes original suspension complete with chain. $3,700.00 Nakhimov Medal, Var. 1 (with engraved serial number), #1237, with a document, awarded in January 1945 to a Naval Infantry Reconnaissance Scout. Serving as a radio operator with a forward assault group, he showed outstanding bravery in amphibious landings on German-held islands in the Baltics, and in particular during the storming of the Ruhnu Island in the Gulf of Riga. While disembarking from the ship onto a row boat, his boat capsized in strong gale in a subzero temperature. Incredibly, he would not let go of his radio station and ammunition while clinging to the overturned boat in raging sea until he was rescued by the other marines. After reaching the bank, instead of changing his ice-covered clothes or trying to dry up, he immediately deployed the radio station and established radio link with the ships supporting the operation off shore. During the war, this heroic sailor of Soviet Naval Spetsnaz earned two other decorations for similar kind of seaborne assaults, as well as Badge of Excellent Radio Operator. His award commendations (copies of which are included) are among the best we have seen for a naval infantryman. The medal is in very fine to excellent condition. $495.00 Medal for Valor, Type 1, Variation 1 (on a wartime Variation 3 rectangular suspension), #26913, circa early 1942 issue. In very fine to excellent condition. $480.00 Medal for Valor, Type 1 Var. 2 (with hand-engraved serial number), #38968, circa early to mid-1942 issue. In very fine to excellent overall condition; comes on original suspension. $475.00 Medal for Valor, Type 1 Var. 3, #69315, awarded in August 1942 to State Security Junior Lieutenant, an officer of NKVD Special Department (aka SMERSH) of the 307th Rifle Division, Bryansk Front. According to the award recommendation, he prevented a number of defections in the military unit he watched and uncovered a number of "vile spies of fascism" among the civilian population. He also showed personal bravery in an infantry assault near Oryol when leading the troops by example. The medal is in very fine condition and includes complete original Type 1 suspension. Comes with archival research. This is a highly unusual early award for a SMERSH officer! $335.00 Medal for Valor, Type 1 Var. 3, "Thick" Sub-variation, #97657, awarded to a Reconnaissance Scout Private for a January 1943 raid behind the enemy lines in the Kaluga region (southwest of Moscow). He took part in capturing a prisoner and provided covering fire for his recon team while inside the German trench. The medal is in very fine condition, an attractive piece with original Type 1 suspension and ribbon. Comes with archival research. $340.00 Medal for Valor, Type 1 Var. 3, "Thick" Sub-variation, #139516, awarded in February 1943 to a Mounted Reconnaissance Corporal. During a raid behind the German lines near Kursk, he and his detachment killed 8 Nazi soldiers and captured 3 wagons with valuable supplies. The medal is in very fine to excellent condition, much better than average for a Type 1. Comes with archival research. $330.00 Medal for Valor, Type 1 Var. 3, #204967, awarded to a Senior Sergeant in 1st Guards Airborne Division, Northwestern Front. During the March 1943 liquidation of the Demyansk Bulge, he was put in charge of two 75-mm gun crews that within 3 days destroyed 14 German pillboxes. The medal is in very fine condition and includes complete, fully original Type 1 suspension. Comes with archival research. $80.00 Medal for Valor, Type 2 Var. 1, #617044, circa late 1943. Note the low, 6-digit serial number. In very fine condition. $80.00 Medal for Valor, Type 2 Var. 1, #844353, circa March - April 1944 issue. Relatively scarce and early sub-variation with "short armor" and 6-digit serial number. In very fine condition, better than average for any WW2 Valor Medal - let alone the "short armor" version. $50.00 Medal for Valor, Type 2 Var. 1, #1896148, circa late 1944 - early 1945. An attractive wartime piece in very fine overall condition. Comes on original WW2 suspension with new ribbon. $95.00 Medal for Valor, Type 2 Var. 1, #1975325, February 1945 issue. The serial number is mentioned in the book "Echoes of War" by Paul Schmitt, which states that the medal was bestowed by the 533rd Antitank Artillery Regiment (61st Army, 1st Belorussian Front.) A superb example with perfect lacquer and details; comes on original WW2 suspension with old ribbon. $65.00 Medal for Valor, Type 2 Variation 1, #3624506. In very fine to excellent condition, a very attractive piece on original suspension. This medal was likely issued based on a 1944-45 award decree within a year or two after the end of the war. $85.00 Medal for Valor, Type 2 Var. 2 (U-shaped eyelet), #3384191, circa 1946-47 issue. An excellent, near perfect example on original suspension. Very uncommon in this condition. $70.00 Medal for Valor, Type 2 Var. 2 (U-shaped eyelet), #3583792, circa 1946-47 issue. In very fine to excellent condition. $450.00 Medal for Combat Service, Type 1, Var. 2 (with engraved number), #30084, circa 1942 issue. In excellent condition and includes complete original rectangular suspension from an early Variation 3 medal. $195.00 Medal for Combat Service, Type 1 Var 3, "Thick" sub-variation, #202465, circa early 1943. Very fine to excellent example with almost completely intact red lacquer in the letters. Comes on original suspension with old, probably original ribbon. $195.00 Medal for Combat Service, Type 1 Var. 3, #96853, October 1942 issue to a Mortar Man Private for a series of actions near the town of Staraya Russa (north of the Demyansk bulge.) After killing as many as 100 Nazi soldiers, his mortar team was dubbed "snipers" for precision of their fire. The medal is an early "thick" version in very fine condition; comes on original rectangular suspension. Archival research is included. $160.00 Medal for Combat Service, Type 1 Var. 3, early "thick" version, #225118, circa early 1943 issue. In very fine condition and includes original suspension. $65.00 Medal for Combat Service, Type 2, Var. 1 (with curved down hilt of the saber), #623411, circa late 1943 issue. In excellent condition, a truly superb example on original suspension - about as close to being in mint condition as wartime medals ever come. This medal was almost certainly awarded well before the mass length of service issue which started in late 1944. $45.00 Medal for Combat Service, Type 2, Var. 2, #1972232, circa early 1945 issue. A superb example, practically impossible to upgrade. Comes on original WW2 suspension. $35.00 Medal for Combat Service, Type 2, Variation 2, #2932184, circa late 1944 - 1946 issue. A very nice late war - early post-war example on original suspension. $55.00 Medal for Combat Service, Type 2, Var. 3 (with U-shaped eyelet), #3019660, circa 1946-47. A very fine to excellent example on original suspension. $25.00 Document for an unnumbered Combat Service Medal, 1965 issue. In very good condition. $35.00 Medal for Irreproachable Service in the Armed Forces, 1st cl. (for 20 Years of service), Variation 1 in Solid Silver, circa 1959-1960. In excellent, near mint condition. This medal is far less common than the regular silver-plated version. $5.00 Medal for Irreproachable Service in the Armed Forces, 1st cl. (for 20 years of service), 1960s-1980s. In near mint condition. Comes with original storage / issue box. $4.00 Medal for Irreproachable Service in the Armed Forces, 2nd cl. (for 15 years of service), 1960s-80s. In near mint condition; comes with original storage / issue box. $3.00 Medal for Irreproachable Service in the Armed Forces, 3rd cl. (for 10 years of service), 1960s-1980s. In near mint condition. Comes with original storage / issue box. $20.00 Document for a Medal for Irreproachable Service in the Armed Forces, 3rd cl., awarded in 1960 to a Sergeant Major. A relatively uncommon issue to an NCO for 10 years of uninterrupted service. In excellent condition. $95.00 Medal for Distinguished Military Service, 1st cl., 1970s-80s. In excellent condition. $45.00 Medal for Distinguished Military Service, 2nd cl., 1970s-80s. Excellent condition. $395.00 Medal for Strengthening Combat Cooperation, 1980s. In near mint condition.